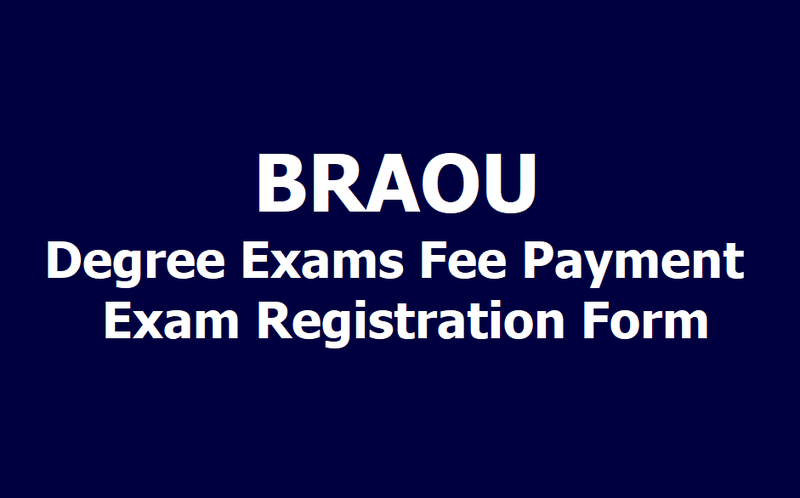 How to Pay the BRAOU Degree Exams Fee through Online, How to fill the BRAOU Degree Online Exam Registration Form, Steps to fill the Dr BR Ambedkar Open University Degree Online Application Form. How to Apply for Ambedkar Open Degree Exams. Candidates are advised to visit the portal www.braouonline.in and click on BRAOU U.G. Examination Registration Form for Semester III Registration. The prescribed fee may be paid at any T.S./A.P. Online Centres or through debit/credit card on or before 01.05.2019. (The students of Science subjects must pay the Practical Exam fee along with the Theory Exam fee as a single payment). For further details candidates may contact their concerned study centers. Please note that only those students who have paid the Tuition Fee are eligible to appear for these examinations. Further the students who are appearing for first time have to pay examination fee for all papers in their course. Students are permitted to write the answers in Urdu only in those subjects offered by the University in Urdu medium. History, Political Science, Public Administration, Botany, Zoology and Chemistry are offered in Urdu medium by the University. If the Candidates answer in Urdu in other Subject, their scripts will not be valued. 1. The examination fee prescribed for each course (paper) of Undergraduate programme is Rs.100/- There is no fee exemption for any student since these are Semester End Examinations. - Students who opt for Science subjects have to pay Rs. 100/- extra per each paper of Science subject towards practical exam fee. - The Examination Registration Forms can be uploaded by the candidates through online from 08.04.2019 only. 2. The Examination Registration Forms without online (off line) are not allowed by the University and no further correspondence shall be entertained in this regard. The Students can download their Hall Tickets from the University website www.braouonline.in (03) days before the commencement of the Examinations. The Examination Centre will be mentioned in the Hall Tickets. 3. Please keep a Xerox copy of the print out issued by TS/AP online Centre after registration and uploading of information. 1. Students need to apply all papers in single application form including practical papers. No separate application form is accepted for individual years. 2. Do not depend on others for Examination Registration. Verify the following points carefully in your Application before payment of exam fee. a) Verify all the optionals and papers applied correct are not. b) Apply all Pending or Failed papers and verify all the applied subjects and papers on Exam application printout are correct. c) Verify Applied Subjects, Applied Papers, Exam Centre/ Study Centre, Medium, MIL in case of UG firstyear are correct or not. d) Pay your exam fee at APONLINE franchise centre after careful verification of exam application printout. 3. Exam registration/Modification is not possible once examination fee paid. If you want any modifications in exam application form, please modify before exam fee payment. Step 2: Click on U.G. Examination Registration Form for Semester II. Step 3: Then, the "Degree Examination Registration Form" Window opens. Step 4: Then the student enters his admission number and date of birth. Once entered the admission number and date of birth, candidate will get the details of his/her hall ticket number, name, father name, date of birth, Social status, Medium and blanks of subject wise with preference 1,2,3 for papers registration. Step 6: Pay the required fee. . On this application number only the candidate should pay the required fee through Debit/Credit card or at any T.S/A.P. Online Center and collect the receipt and keep it for future reference. Step 1) Go to "Update Examination Application Details (If already applied)". Step 2) Enter your Admission Number (only last seven numbers from your admission Number) and Application Number (9 Digits number). Step 3) Re-apply all papers and verify all papers are applied or not. Step 4) Finally go for exam fee payment at nearest APONLINE centre. Still your facing problem contact exam help line: 040-23680567, 040-23680568. 4. Physically challenged candidates should contact Exam help line after exam registration for fee exemption.